Google, the world’s largest search engine, can give your business more visibility. Your business listing takes minutes to set up. What’s more, you pay nothing to create your new online presence. Your business listing shows up for your service, but people are searching whether at the desk or on mobile. For instance, someone out for a bike ride can find your bike shop instantly; your address and phone number show up and there’s a map to help visitors get to your business. Or, if everyone is hungry after a long day of work or play, your pizza shop comes up as nearby; the group calls from the listed number and pizza arrives their door. According to Google, customers consider a business with a complete listing more reputable than competitors without. Consumers are 38 percent more likely to visit your business when you have a complete listing. Go to gybo.com to create your free listing. When you arrive at the gybo page, check to see if your business is already listed. 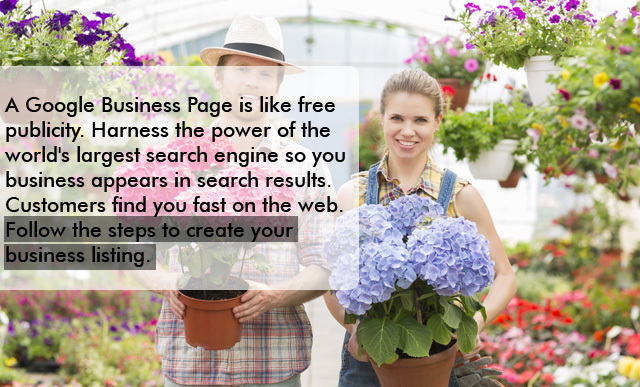 If you have not created a business page your business will probably not show up. It is best to check, just in case. If you have already created a listing, gybo takes you right to it. If you deliver goods and services, visitors know right away if they are within your local area. If you deliver nationwide or even internationally, you don’t need to check the deliver goods box. To create your business page, Google needs to verify the business. Google sends you a verification code by mail. Yes, snail mail. Google says it may take up to two weeks, but most businesses receive the verification mail in about a week. This action verifies that your business receives mail at the listed address. Google prints your verification code on the mailed card. Enter that code on your new business page and you are on board. If you are not a local business you have three other choices: storefront, service area or brand. If you select brand, you can further define your business as brand, entertainment or community. The resources tab offers three main resources to help promote your business. • Partnership with Staartlogic to provide a free domain name and website for one year. Your business page let’s people discover you with one click. For just a few minutes of time you create a fast and easy way for potential buyers to get to you. Search engines have the power to help customers find your business with ease. Take advantage of online marketing services to make more sales. Previous Post Who Should Manage Your It Manager?